Vitamix has started their 2018 Labor Day Sale. Sale prices are scheduled to last until 11:59PM ET on September 9th. You can save $50 to $100 on a new machine! If you’re buying new, I highly recommend getting an Ascent model. They are in the same price range as the Legacy models, but they come with a 10-year instead of 7-year warranty, and they have a variety of new features. Check out my Ascent review for help deciding which one to get. A2300 has everything you need for $379.95 (C$529.95 in Canada). If you want a high-end machine, but don’t like the look of the Ascent machines, consider the Pro 750. The entry-level E310 is also included in the sale, at $299.95. The E310 isn’t as fancy, but it blends just as well. For more details, see my Explorian E310 Review. I generally don’t recommend the Space Saving S-Series these days, because now there are personal blending cups that work with the full-size machines. The Space Saving machines are less powerful, and don’t save that much space. However, they’re well-made, and are perfect for some people (here’s my review). If you want one, they are also $50 off. These deals are compatible with the free shipping promotion code, which will be applied if you click a Vitamix link from this site. If you’re shopping for a Vitamix this Labor Day and are looking for the lowest possible prices, you are in luck. If you want to better understand the various features, check out my Vitamix model comparison page. Even “used” containers that are sent to Vitamix as part of the shop returns? If they fix the reconditioned units with new containers, there must be a whole lot of new-ish containers left, no? Occasionally containers go on sale, but usually as part of a bundle with new machines. Vitamix does not sell used containers. When they recondition returns they clean and re-use the blades if they’re in good shape. But the “used” blades are only sold with reconditioned models. They do not sell them individually. And they do not re-use the container shells—I believe they recycle them, but I do not know the details. Thanks. I have been reading your site for months. I have cleaned up my eating habits for health issues and a vitamix seemed to fit in my plans. I retired effective 9/1. My wife was kind enough to help me order an Ascent model via the links on your site (Labor Day sale and to get the free shipping )as my retirement gift. The accessories I wanted are out of stock. 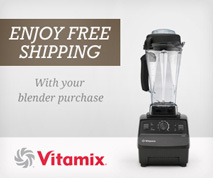 Do you know how long it usually takes Vitamix to restock and how long it takes time receive the blender? Which are the accessories you are looking for? Vitamix is having trouble keeping up with demand for the 8-oz and 20-oz Ascent cups. With the new release, this is a relatively unprecedented situation, so it’s impossible to say when they will be back. Hopefully within the next month or two. If you are interested in the 8-oz bowls, they are in stock at Sur la Table. I believe your blender should arrive within about a week.